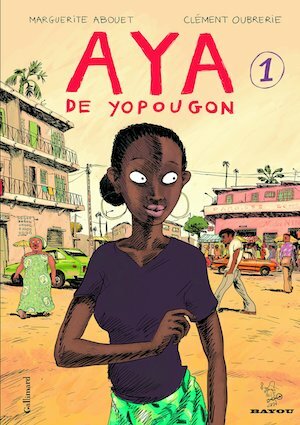 The three young women in Aya of Yop City, the first in a series of graphic novels, have boys, parties, marriage and future careers on their mind. They rebel against their parents, pick unsuitable boyfriends and try to figure out their place in the world. The three friends—Aya, Adjoua and Bintou—live in Youpougon (known as Yop City in slang), a neighbourhood of Abidjan in the Côte d’Ivoire. The central character, Aya, is a hard-working and ambitious young woman who wants to become a doctor. Adjoua and Bintou, on the other hand, are interested in the “three c’s”: “coiffure, couture et chasse au mari” (hairstyles, clothes and the hunt for a husband, preferably a rich one). It’s a conventional role for a woman, and something that Aya’s parents want for her too. But she has other plans and is determined to see them through. Aya’s parents set up a meeting with Moussa, the spoiled and none-too-bright son of Aya’s father’s boss. Aya is not at all interested, but her friends are. Moussa has money to spend, and takes Bintou partying. Meanwhile, he is also seeing Adjoua. The relationship has gone beyond partying, with the inevitable outcome—she becomes pregnant. The family is central, and the girls’ families are very much part of the story. In the first few panels, the reader is introduced to all of them. When Adjoua becomes pregnant, she goes to see Aya’s mother, Fanta, who is a healer. The mother and daughter are the core of this community—both, in their own ways, provide succour and level-headedness. The book combines humour and social critique with believable characters. I felt like I’ve met some of these people, and I want to know what happens to them. The book is beautifully drawn by Clément Oubrerie and captures the vibrancy of both the place and characters. Although it is not autobiographical, it is based on Marguerite Abouet’s experiences growing up in the Côte d’Ivoire. Like many Africans, she was fed up of the media’s focus on the wars, famines and poverty, and wanted to present the day-to-day life of ordinary Africans. She has succeeded with this very enjoyable series. Thanks, Cristina! I’m not sure if I’m the right person to write the review. I’m sure there are people who have read the entire series! It’s very well known.